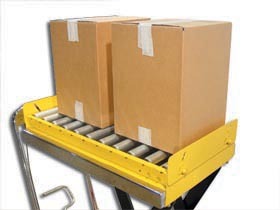 Job specific conveyor sections for easier material transfers. Recommended for hydraulic elevating carts and post tables. Comes standard with retractable stops at both ends of conveyors. Handles loads up to 800 lbs. Roller spacing on 3" centers. Platform size 18"W. x 32"L. Attachable to many hydraulic carts. Lift cart sold separately. Custom sizes available. FOB Shipping Point. Click here to see more Conveyors!